March is National Nutrition Month, which is a nutrition education and information campaign, focusing on the importance of making informed food choices and developing sound eating and physical activity habits. So, we reached out to some of our talented and experienced chefs and asked them to share their advice for making healthy food choices this month and beyond. Today’s chef is Chef Ginny Thiell. 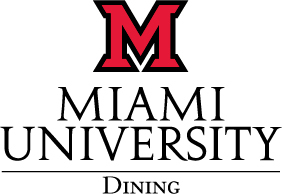 Chef Ginny Thiell currently works as an Executive Chef for Miami University Catering. Chef Thiell is a Miami grad with a wide range of experience at different restaurants in the Cincinnati area, including experience as a chef at a vegan restaurant. Q: Tell me a little about yourself and your background in dining. I’m a Miami grad who has had a passion for cooking ever since I can remember. After leaving Oxford, many years ago, I worked my way up through several restaurants in Cincinnati, eventually taking the challenging position of Chef at a vegan restaurant in Clifton. Giving up so many cornerstones of traditional cookery – butter, cream, animal proteins – encouraged a lot of out-of-the box thinking in creating nutritious and tasty fare. Q: Tell me what you do here at Miami, the different tasks you are responsible for and what role you play in our dining services as a whole. I returned to Miami and, after several interesting and rewarding job positions, I am currently Executive Chef for Miami Catering. Our kitchen is involved in events that vary from picnics to working lunches to weddings. Q: The theme for National Nutrition Month this year is “Put Your Best Fork Forward” to emphasize that each of us holds the tool to make healthier food choices. What does this theme mean to you and in what ways do you believe people/students can make healthy changes to their diets during National Nutrition Month? “Put Your Best Fork Forward” means, to me, moderation and an awareness of what we eat. I’ve been a vegetarian for 30 years so I’m a big fan of a plant-based diet. This doesn’t mean a vegan/vegetarian diet is for everyone, but less animal products and more veggies, fruits and grains are a great foundation for any diet. Good nutrition is often perceived as boring and rather puritanical, but it’s really just choosing the best fuel for your body so you can be on top of your game.